It had been a quiet week in town until tragedy almost struck when children were engulfed in a house fire in Dall Street. Alert neighbours were quickly on the scene with three of them, Bernard Taylor, John Rogers and Ray Booth the real heroes. The three friends all dashed to the house to help rescue the children. All three of them needed hospital treatment but none were seriously injured and all won praise from the fire service for their bravery. There was good news for the sportsmen and women in town with the re-opening of the newly refurbished Thompson Centre, just over 17 years after its initial opening. To celebrate the opening a certificate went on display after the centre had held a Swimarathon to raise money for the British Disabled Sports Association and Childline. They had raised £3,114.28 out of a national total of £763,787.00 and there was real excitement when the certificate arrived signed by both Michael Aspel and Esther Rantzen. Today, a stag do can last for a number of days and can be held in various locations around the globe. In 1991 they were often more local but for four Burnley lads one such night as far away as Oldham ended in court when all four were arrested following a disturbance. That was nothing compared to one man who was charged with the attempted murder of three residents of Lindsay Street. He was also charged with two offences of possessing a firearm, one with intent to endanger life. A woman smashed her way into a house with a cricket bat and then smacked a copper with it. I'm not sure whether the umpire signalled six but she was fined a total of £105 plus £10 costs in court. And one poor man was described as inadequate by a lady he had exposed himself to on the Gannow Wharf section of the Leeds & Liverpool canal. She also said he was between the ages of 25 and 35 and between 5'8" and 5'10" tall. The police were asking for help in putting together a more detailed description. The name Tommy Boyle is a famous one in Burnley, but not the one who turned up on the Saturday morning in town. He was there to officially open the brand new Shanahan's Wholesale Interiors in Hubie Street. This Tommy Boyle was an actor who had played money lender Kenny Maguire in Brookside but at the time was Coronation Street's Phil Jennings who had the unfortunate role of bedding Deirdre Barlow whilst conning her out of some money. In the world of football, one Burnley supporter had slated the club via a letter in the Burnley Express, far from happy that they'd spent just £35,000 in the transfer market over the summer. Needless to say his letter had been posted the day BEFORE Steve Davis arrived for £60,000 from Southampton. That signing had given everyone a big boost and so there was plenty of optimism ahead of the opening day trip that was to Rotherham and not sunny Donny where some would have you believe the season started. Manager Frank Casper named all three new signings - Steve Davis, Steve Harper and Mike Conroy - in his starting line up but strangely opted for a 5-3-2 formation and played a very direct style of play which was alien to the way Casper would normally play football. Even so, we got off to a bright start and, with just three minutes gone, Conroy and John Deary combined to set up Ian Measham but he just couldn't quite get onto the ball and Rotherham goalkeeper Billy Mercer was out quickly. They collided and both needed treatment but the chance had gone. John Francis put a header wide from a Harper cross and then Mercer just about claimed an Andy Farrell cross as Harper looked set to give Burnley the lead. It was the sort of start the Burnley fans wanted but it didn't last. We were put under some enormous pressure for long periods in the first half. Pearce made two good saves, Cunningham hit the bar and another couple of efforts were blocked. Into the last ten minutes of the half and somehow we were still level. Mark Monington ended another Rotherham attack with an excellent sliding challenge and then the deadlock was broken and incredibly in our favour. It came from a Joe Jakub free kick that was only half cleared. Harper mishit his shot but it found Francis who was just able to get it back across goal. Defender Nicky Law missed it and there was CONROY to force it home from close range. It could have been 2-0 by half time but a Farrell shot went just wide but Burnley were happy enough when referee Graham Poll blew for half time with the score 1-0. We'd suffered some real pressure but seen it off and were now very much in the driving seat. That, sadly, all changed in the second half and we hardly got a foothold in the game. The first quarter of an hour was spent almost inside our own penalty box and we were battling hard to keep our lead. As the half went on we went deeper and deeper. The midfield pair of Deary and Farrell were hardly in the game as both sides played the ball long and it seemed inevitable that Rotherham would eventually grab an equaliser. They did, with 17 minutes remaining. A long throw found JOHNSON whose header was touched into the net by Pearce. Now, it was a case of fighting to save the point but that fight lasted just another five minutes. Goodwin played in a free kick. It was met by CUNNINGHAM who turned and swept the ball home and Burnley were starting the season with a defeat. In the end it simply wasn't good enough and manager Frank Casper said: "We did not get hold of the ball in midfield or up front and slow things down. If you are forcing your back five to defend on the six-yard line too often something has got to give sooner or later." He continued: "I thought Steve Davis, Mark Monington and John Pender were excellent, but I can't see any defence holding out under that sort of pressure. "During the first half I thought we did a lot of the right things and just about deserved to be in front. Conroy took his goal well and John Francis deserved credit for creating the chance, but after the break I think we relaxed too much and gave Rotherham the chance of getting back into things." Rotherham United: Billy Mercer, Chris Hutchings, Ronnie Robinson, Neil Richardson, Nigel Johnson, Nicky Law, Shaun Goodwin, Dean Barrick, Tony Cunningham, Don Page, Desmond Hazel. Subs not used: Shaun Goater, Julian Watts. 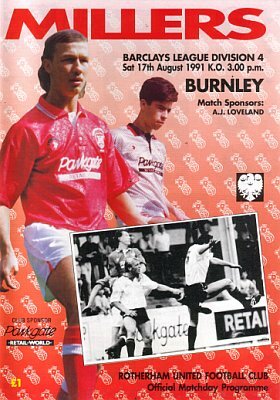 Burnley: Chris Pearce, Ian Measham, Mark Monington, Steve Davis, John Pender, Joe Jakub, Andy Farrell, John Deary, Steve Harper (Jason Hardy 72), John Francis (Graham Lancashire 51), Mike Conroy. Elsewhere the most remarkable game came at Underhill as Barnet played their first ever game in the Football League following promotion from the Conference. Both Gary Bull and Mark Carter scored twice but it wasn't enough as they went down to a sensational 7-4 defeat with former Claret Ron Futcher netting Crewe's second. 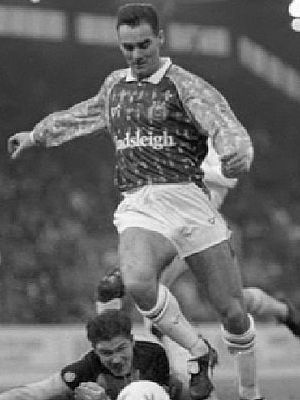 Also on the opening day goalscorers list was future Claret David Eyres. He got Blackpool's second in their 3-0 win agains Walsall at Bloomfield Road. With an odd number of teams in the league it meant no game for Aldershot who would start their season a week later at Burnley.